© Bloomberg. Pedestrians pass a Turkish flag hanging from the Fatih Mosque ahead of a demonstration against the relocation of the U.S. embassy to Jerusalem in Istanbul, Turkey, on Friday, May 11, 2018. No major power recognized Israeli sovereignty in Jerusalem until U.S. President Donald Trump did so on Dec. 6. 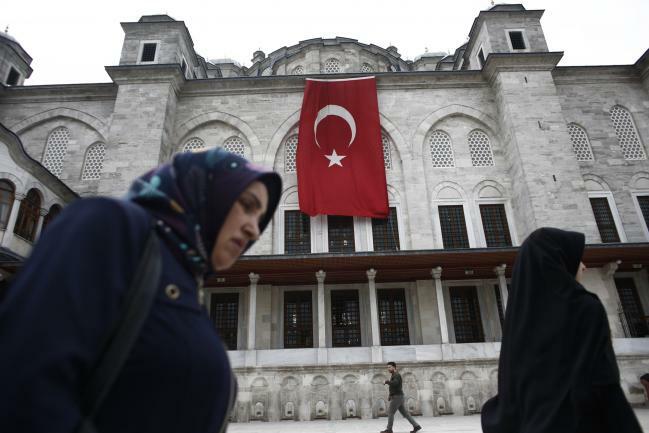 (Bloomberg) — Turkey’s top economic body ruled out seeking support from the International Monetary Fund, in an effort to end market speculation that Ankara is in touch with the Washington-based lender to negotiate a rescue package. Market chatter about a possible agreement with the IMF intensified after the lira lost more than a quarter of its value in August last year. The currency crash pushed consumer inflation to over four times the official target of 5 percent and may have even tipped the economy into its first recession in a decade by hurting everything from domestic demand to industrial output. After last year’s market rout, President Recep Tayyip Erdogan said Turkey would never take another loan from the IMF as the lender’s conditions make it impossible to pursue an independent foreign policy. The Treasury’s latest intervention is unlikely to silence Turkey watchers who are convinced that the nation will eventually need an IMF anchor to stabilize its economy. The announcement on Friday is “a case of biting off your nose to spite your face,” said Timothy Ash, a strategist at BlueBay Asset Management in London. “If Turkey actually went on an IMF program, it would reduce risk premiums, rally the lira and bring forward” interest rate cuts.